Bitter Gourd is one of the most popular vegetables in China, Taiwan, Vietnam, Thailand, India and the Philippines.Bitter Gourd (Karela) (kakarakaya) is a valuable vegetable gifted to us by Mother Nature. It is one of the healthiest vegetables known to man. Bitter Gourd is one of the healthiest vegetables in the world but as the name suggests, this vegetable has a strong bitter taste. However, people who are fond of eating tasty food, avoid consumption of this vegetable due to its bitterness. Apart from being eaten mainly as vegetable, it is particularly reputed as a folk medicine due to its therapeutic properties. Although the bitter taste can turn you away, but it can really improve your health.The Bitter gourd is particularly used as a remedy for diabetes because of its hypoglycemic action. It contains insulin-like peptides, alkaloids and charantin, all of which act together to lower blood and urine sugar levels without increasing blood insulin levels. 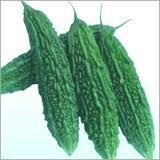 Bitter Gourds are very low in calories; one cup of bitter gourd contains only 16 calories. But they are packed with precious nutrients. 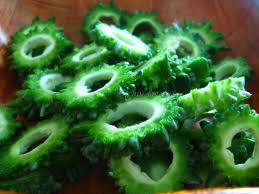 Bitter Gourd is an excellent source of vitamin C, B1, B2, folic acid, and B3. It contains 130 % of the daily value for vitamin C, 9 % for vitamin A .Fresh Bitter Gourd is an excellent source of vitamin-C one of the powerful natural antioxidant. Bitter gourd is high in iron, contains double amount of the calcium than spinach, twice the beta-carotene than broccoli, and twice the potassium than a banana. As well, it’s a good source of magnesium, zinc, phosphorus, manganese, and copper. Bitter Gourd stimulates digestion which can be helpful in relieving indigestion and constipation problems. 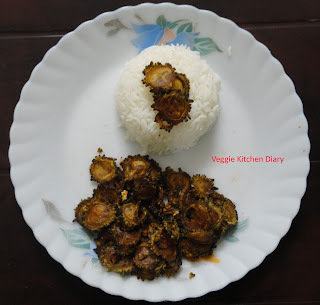 This recipe reduces the bitterness of kakarakaya and is more palatable. 1.Cut Bitter gourd /Kakarakaya into circles. 2.Heat enough oil to deep fry in a deep frying pan. 3.Once the oil reaches the frying temperature, fry kakarakaya cubes till they are crunchy, crispy and golden brown. 4.Finally,add salt,red chilli powder and coriander powder and toss well. 5.Serve as a side dish for Sambar/Rasam with hot rice.